Advantages: They’re free and the perfect size! You’ve probably seen pallets piled at construction sites or stacked at loading docks behind businesses and warehouses, awaiting recycling or disposal. Explain to the head honcho you’d like to recycle some to make a compost bin. Most places pay to have them hauled away and are happy to oblige. Look pallets over to make sure they’re in decent shape before carting them home. 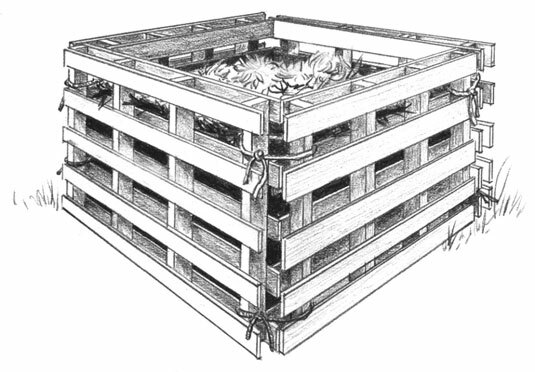 Disadvantages: Depending on size and type of wood, a single pallet can weigh 20 to 50 pounds (9 to 23 kilograms). Pallets aren’t as easy to reposition around the yard as some choices, but they’re still faster to move and set up than concrete blocks or straw bales. Build a compost bin from shipping pallets.